All you need to do to collaborate is: 1. TAKE A PHOTO OF TEXT based graffiti in your local area. 2. EMAIL THIS PHOTO to to me with a description of where the graffiti is and anything else you want to say about it. 3. I WILL MAKE A DRAWING of it and send it to you. 4. PUT THE DRAWING BY THE GRAFFITI you took a photo of in your local neighbourhood. 5. YOU CAN: LEAVE it there, KEEP it, COPY it lots and put copies where you like in your neighbourhood, SEND IT BACK to me, GIVE IT TO SOMEONE ELSE or ANY of these things and more!. 6. 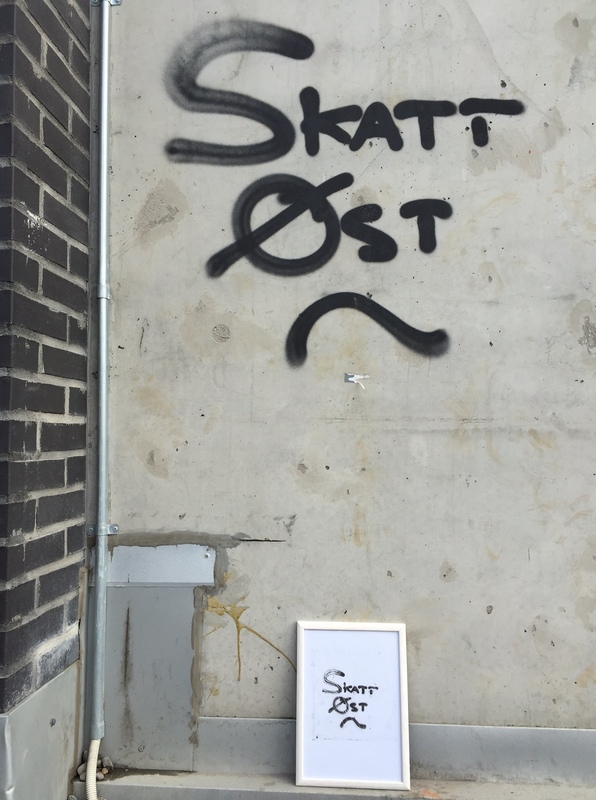 Whatever you choose to do, PLEASE DOCUMENT it and SEND ME A PHOTO of the drawing in situ with the original graffiti! On April 12th I received an email from Sidsel, a collaborator in Oslo. She sent me 6 photos, one a view of her neighbourhood from high up and the rest showing the drawing with the graffiti. I had not expected someone to frame their drawing and it gives it a different presence. I was really pleased to see she continued the gifting and passed the picture I gave her to a friend. needed a weekend in order to get this done. Today I took the ten min walk up the hill, north of my appartment to find back to the graffiti that I took a picture of and sent you, that you then drew. 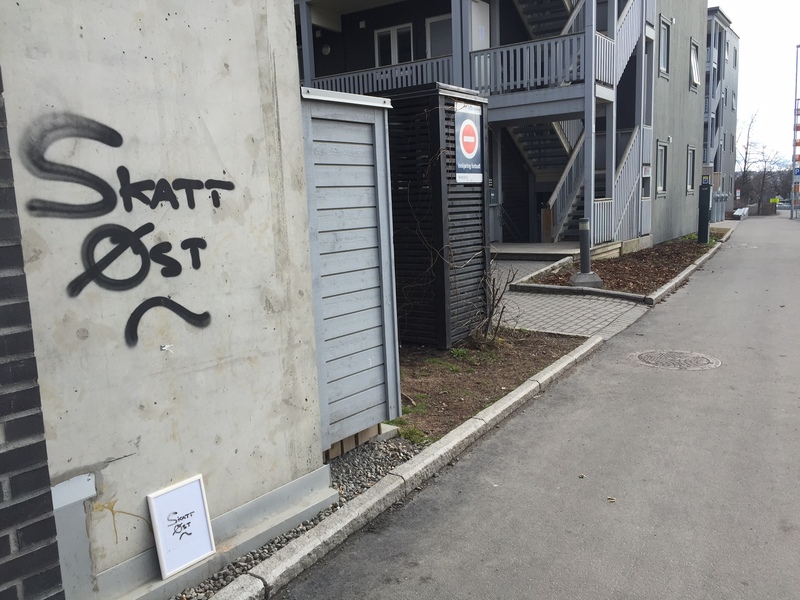 As you can see from the photos, I framed the drawing and has decided to give it to someone with a not so pleasurable and quite complicated relationship to Skatt Øst, our region´s tax administration. I do this to give him a different, hopefully more fun perspective on the tax claims he is struggling with. What is special about this part of town (Hovinbyen) is that there is going to be build 27 000 new apartments here that will house 100 000 more people over the next 15 years. Oslo has about 750 000 people within the city limits so it will be a substantial growth of the capital. The block of flats that you can see on these photos is just the start of this development, and this is one of the first graffitis that has appeared in the vicinity. Hope this is what you wanted and needed to go on with your fun project! Thanks for letting me be part of it! 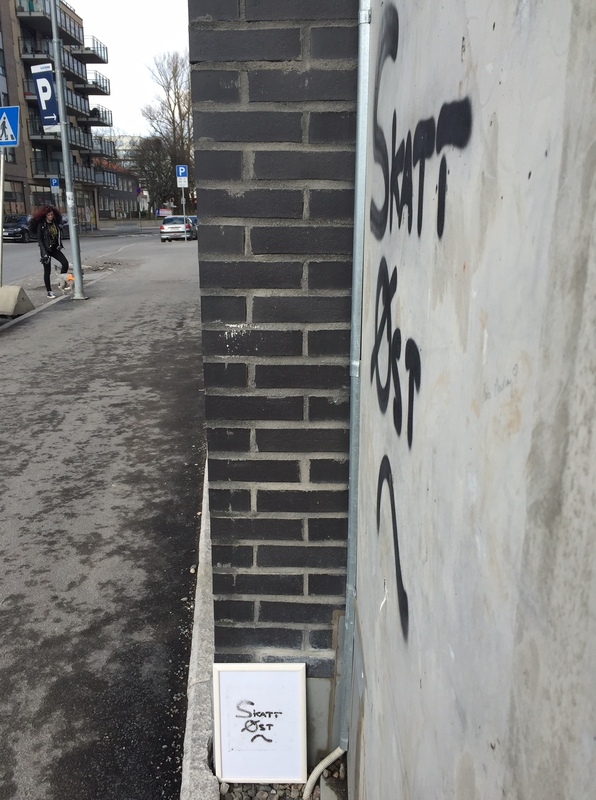 This entry was posted in Collaborations and tagged Collaboration, Drawing, graffiti, Intervention, Oslo by Lucy Lyons. Bookmark the permalink.